Why would I want to take all the tasty stuff (butter, milk, eggs) out of a cake? I’m not a vegan, I’m not intolerant and I LOVE dairy. Well, because having Thyroid Cancer, means that prior to scans and also treatment, I have to suffer two weeks of the worst diet in the world – a low iodine diet! Iodine is a trace mineral, so it is not listed in ingredients on food items. It would be easier to ask, what doesn’t! Nearly everything you buy in the shops, contains iodine. Iodine is not bad for you, and is a healthy part of a normal diet; which makes is virtually impossible for Thyroid Cancer patients, to find things they can eat. Last time around, I didn’t cope very well with the low iodine diet. So as this weeks Great British Bake Off challenge was to make a Dairy Free vegetable cake, I am slightly altering mine – instead of a dairy free vegetable cake, I am making a dairy free, egg free, soya free, vegan, low sodium, low iodine chocolate cake (without vegetables)! 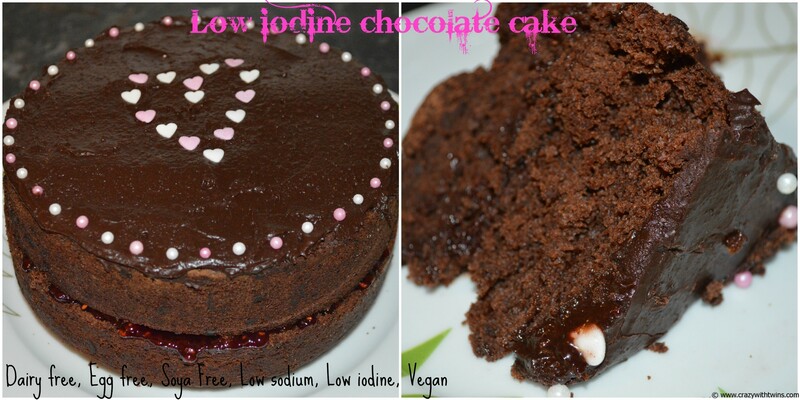 This is not only suitable for people on a low iodine diet, but also for a lot of people with food intolerances. 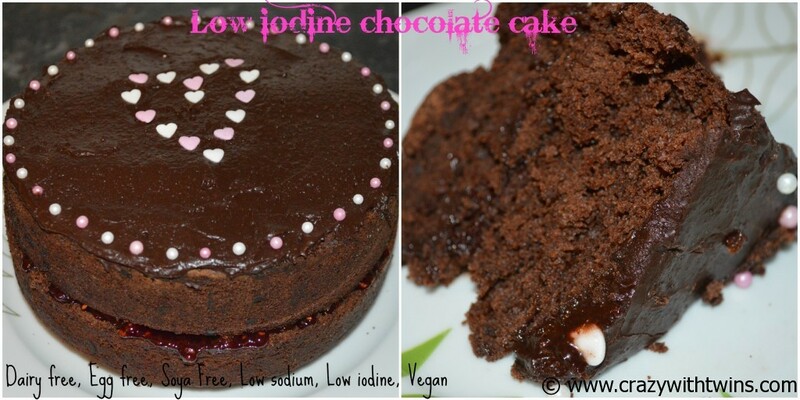 This chocolate cake is suitable for Thyroid Cancer patients on a low iodine diet, as well as being suitable for a Vegan diet. It is egg free, dairy free, soya free, low sodium and low in iodine. Sift half the flour in & mix on high for 5 seconds. Switch mixer on low and add all the wet ingredients through the funnel. Add the rest of the sifted flour and mix for a further 20 seconds. Pour the mixture into a greased, lined cake tin. Bake on 175 degrees Fan Assisted for 1 hour. Once cool, halve the cake and spread raspberry jam in the middle, and sandwich back together. If you are making a nut free version - swap the 200ml Almond Milk for 200ml Cold Water. For shorter cooking times - divide the mixture between two or three tins. I have linked this recipe up to Mummy Mishaps and The Crazy Kitchen for their #GreatBloggersBakeOff challenge. I also have a very exciting GBBO themed giveaway of a £50 voucher to spend in Debenhams cookware department. To enter, use the rafflecopter below. You have until a few hours after the final of #GBBO finishes on TV! 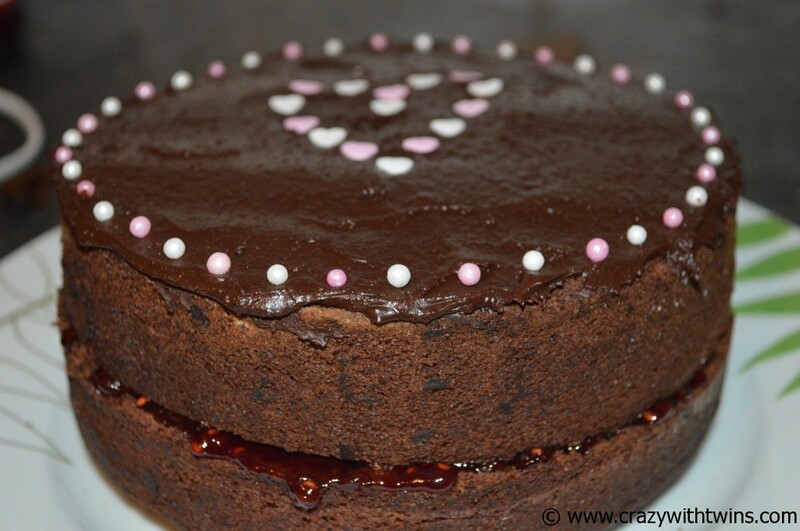 This entry was posted in Blog Hops / Memes / Linkies, Cancer, Charity / Awareness, Competitions, Food, Giveaways, Health, Uncategorized and tagged cake recipe, dairy free chocolate cake, egg free chocolate cake, food intolerances, low iodine chocolate cake, low iodine diet, low sodium chocolate cake, papillary thyroid carcinoma, soya free chocolate cake, thyroid cancer, vegan chocolate cake, vegan diet. Bookmark the permalink. These pans look a good buy http://www.debenhams.com/webapp/wcs/stores/servlet/prod_10701_10001_331001961360_-1, we are a family of 5 and I only have 2 saucepans so would be a good purchase!! These cakes look really good. My daughter had an egg free cake that my father in law made yesterday for her bday. We don’t have any intolerances but my niece has. The Tala Icing Bag Tin Set, and the cake pop baking mold + sticks. Definitely a Le Creuset rectangular dishes- my normal lasagne dish has broken and I now don’t have one big enough! Mum in Meltdown recently posted..Financial Haemorrhaging! 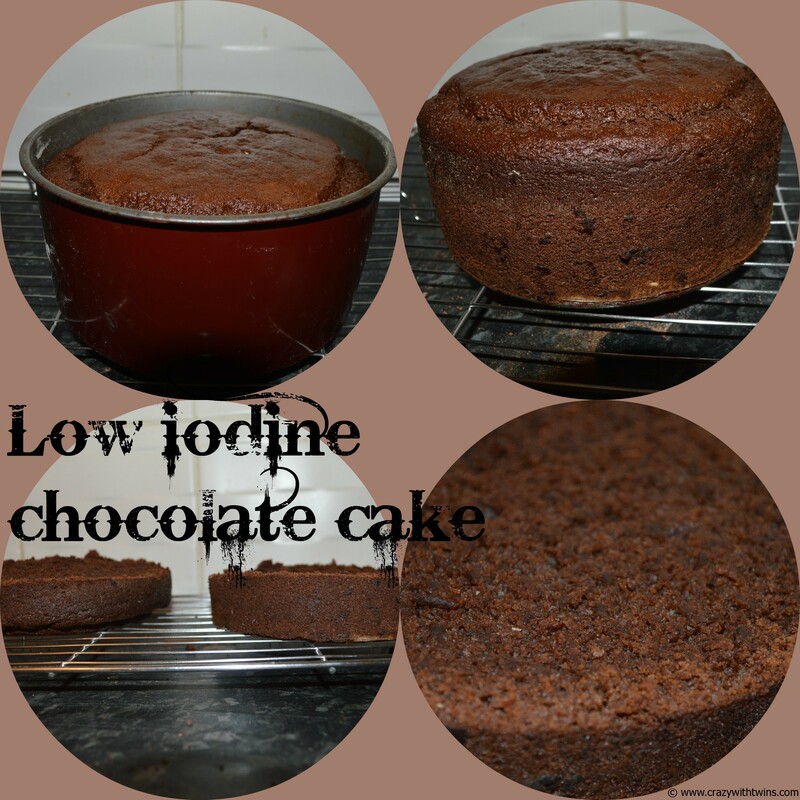 wow didn’t know all those foods had iodine in them…and it’s a massive cake! Wow that’s a lot of things to be free from. It’s nice to know that there is a cake out there for everyone. that still look good even though it’s free of so many things!! I would put it towards a Le Creuset cast iron casserole dish, I have always wanted one. I would buy the TEFAL Carbon steel bread bin! Le Vrai Gourmet pan set! Beky Austerberry recently posted..Social media and raising awareness of little known illnesses and incredible people! I would buy a Tefal black non-stick 28cm stirfry pan. My one drives me mad. I have always wanted a Le Creuset lasagne dish and Debenhams have them on offer at the moment. I am in need of a new roasting tray & I love how deep this Prestige one is – perfect for lovely crispy roast potatoes! yummy! I would put it toward a Le Creuset casserole dish. I would buy my father in law some cookware for Christmas, he’s a keen cook! I would buy a lovely set of chopping boards, http://www.debenhams.com/webapp/wcs/stores/servlet/prod_10701_10001_331009960265CHBR_-1 and a new vegetable peeler. Joseph Joseph Grey ‘Index Advance’ chopping boards. Always wanted these but can’t justify the cost. I’d buy lots of new cake tins – I’d start off with this one – Prestige ‘Create’ Square Loose Base Cake Tin. definitely a must have for the winter months! Bring on the soup! I would definitely get the Tala Icing Bag Tin Set – always nice having a good set for decoration! Tefal Stainless steel twinpack as all my frying pans are knackered! Kenwood FP126 compact food processor. it looks great. I need a new teapot and some matching mugs. Morphy Richards can opener and Joseph Joseph food preparation set! I would buy the Kitchen Complete cook’s blowtorch and a pair of small loaf tins to go with it. I really need a new set of saucepans! Kitchen knives that actually cut cleanly. Would put it towards some new saucepans. Love this Le Creuset red heart deep dish, perfect for those rare romantic dinners for 2 without the family! I’d replace my flimsy, buckled, rusty baking tins with some quality tins. Then I’d obviously have to try them out with a morning/day/week of/month of baking. I would love to have this Mason Bread/Baking bowl! New saucepans as my desperately need replacing. Always wanted an ice cream maker so this would be my first purchase. I would buy this stew pot, mine is on it’s last legs and this one looks to be super, duper for making stews. The Ben de Lisi dog salt and pepper shakers are really cute! I might buy 2 of the Le Vrai Gourmet stainless steel 24cm stock pot, the price is good and I could really do with larger pans. We sometimes make use of rainy days by spending the afternoon cooking up huge batches of chilli, soup or curry to fill the freezer. I’d buy this nice Prestige kettle: (http://www.debenhams.com/webapp/wcs/stores/servlet/prod_10701_10001_331007939860MISC_-1) to make tea to go with the delicious recipe above, of course. I would get a saute pan with lid, so that I could make nice sauces that can simmer for while. Would 100% put the money to my KitchenAid Artisan fund! I’d buy a wok as i’ve needed one for awhile now along with some new baking tins. I would start with a Pyrex dish for our favourite family meal – lasagne http://www.debenhams.com/webapp/wcs/stores/servlet/prod_10701_10001_331010926233DSOB_-1 – this is a fab one with a lid so it means easy storage or freezing! Then I would buy these corn holders http://www.debenhams.com/webapp/wcs/stores/servlet/prod_10701_10001_331016948760UCHD_-1 – my kids love eating corn on the cob and always end up with messy hands so these are perfect! And finally, I would get these sweet little bag clips http://www.debenhams.com/webapp/wcs/stores/servlet/prod_10701_10001_331008100894MISC_-1 – I have pegs on food packets and always need them for my washing! These clips are just what I need! Clare Webb recently posted..The Anagranimals & The Wishing Tree review and giveaway! Oh my goodness how are you finding anything to eat!?! o would buy a large oven dish to make my familys favorite dish chicken and leek pie…. I’d buy the Red stainless steel pasta machine! My hubbys quite a keen cook/baker but has never made pasta before so I’d love to get him one of these for Christmas! The Ben de Lisi dog salt and pepper shakers would “go” well with my doggy cushions in the dining room. I’d put it towards the Select stainless steel 5 piece cookware set.. desperately need some new pans! I would put it toward a Kitchen Aid Mixer in cherry red! A domestic goddess in the making!! This would be great and have £5 left from £50 if was still at this great offer price. i need some new pans! I actually brought http://www.debenhams.com/webapp/wcs/stores/servlet/prod_10701_10001_331001956263FO30_-1 >> Jamie Olives Hard anodised aluminium 30cm frying pan at £50. best Family frying pan I have ever owed. I would love a new quiche tin, the filling always escapes from the one I currently have, doubling the stress levels in the kitchen. Joseph Joseph Index Chopping Boards – I spend ages trying to remember which chopping board I am supposed to be using for what! Anything that would help, and look stylish, would be much appreciated!! I have killed most of my pans, this in in the sale and I need a good set of pans! Curver bins .. My have served me well, but they are due to be side- lined. I cant decide which Le Creuset, I love them all! A new set of pans would be great as mine have seen better days! I really need a new bin so I would put it towards the lovely Simplehuman Silver Round 30 Litre Retro Pedal Bin. Pedal bins have certainly gone up in price since I last had to buy one! my saucepans have metal handles and i always burn my hands!! I would like a couple of Le creuset stoneware dishes. http://www.debenhams.com/webapp/wcs/stores/servlet/prod_10701_10001_331001961060_-1 Im desperate for a new wok! Wow you really worked wonders with that cake! Great job, and I bet it tastes every bit as good as it looks. I really love the Ashley Thomas range of baking wares so I would most likely treat myself to one of her mixing bowls, a rolling pin and an apron. With a coeliac teenage son who needs his own bakeware (and who is rediculously clumsy and keeps dropping them) and me with all my food intolerances I seem to be constantly buying these! I’d get the Joseph Joseph Grey ‘Index Advance’ chopping boards, we’re a little slap dash with chopping boards & I’d rather have separate boards for the meat, so this would be perfect. I would love some Joseph and Joseph chopping boards! Magimix ice-cream maker – yes! Even in THIS weather!!! I would love the le creuset shallow casserole dish , my mum has one and i was saying only ysterday how much i would love to nick it off her 🙂 so i would put it towards one of them. Would love to buy some really good basics for baking, my new Sunday hobby! With three children all leaving home within the space of 6 months, I would buy myself nice new saucepans and oven trays as they have ‘borrowed’ half my kitchen from rolling pins to pasta makers. It’s like I’m the one starting out for the first time! I would buy this for starters cos I really need a new one!! John rocha cheese dome. It would look lovely at christmas! I would buy Le Vrai Gourmet stainless steel 24 cm multi level steamer. I’m on a mission to get more veggies into my family and steaming maintains the highest levels of nutrients. How pretty are these?! They would be perfect for christmas and then pop them away for valentines too. Hi, I’ve only just found your blog. After reading some of your posts it sounds like you’ve had a really tough time. Thank you for the recipe above’ I’ll give it a go and repport back. I’d love another Le Creuset dish to add to my current collection of one! I badly need a casserole dish and love Denby….so this would be perfect! I’m desperate for new saucepans! I would buy some of the pretty baking items as me and my daughter like baking lots of sweet treats, all in moderation. It would be nice to add to my limited glum looking collection and brighten up our baking days. This stock pot, as the lid has fallen off my current one! Debenhams stainlees steel steamer to keep lots of vitamins. I’d buy these saucepans and then some baking accessories with the change! Will def be a new pryex jug, as I have just broken my ancient one on the weekend. I would get an icecream maker for the kids, it would definitely save us money not having to get them from the icecream van. Also we could make Christmas pudding icecream at Christmas, yummy!! id buy 2 of these fab cake tins as i use an old one that isnt spring pop opening and awlays goes wrong when trying to get the cake out! and new fab baking tray for biscuits! There’s too much to decide from right now, but it would likely be some things to help with my baking, and some utensils to replace my horrible ones. I would buy more baking stuff for me and my daughter to bake with. New sauce pans mine are like me old! I would buy this Ice cream maker – my kids and hubby are ice cream mad but my son and I have dairy intolerance’s so would be fab to experiment with soya milk! I’d buy an icing set and also some new baking trays. they have a fantastic collection. dreaming about a soup maker!! i would buy some new pots and pans to replace my old broken handled ones! I’d buy a soupmaker! I really, really want one! I’d buy a slow cooker! …and a new pestle & mortar. I could use a Natural acacia wood recipe book stand by Rocha.John Rocha. I’d buy some of the fabulous Le Creuset in that gorgeous teal colour. I’ve always wanted some Le Creuset items but can’t really justify spending on them when there are so many other things to buy. Corn Cob handles £9.00 because the family eat a lot of corn cobs and I keep meaning to buy some. I would buy a new Frying Pan,new bakeware,and the pink Rolling Pin by Ashley Thomas at Home,so cute. I would choose Maison Cash bread baking set . Wow! Looks good enough to eat! My friend ran across this recipe and was going to make it for me (my oven doesn’t work), but we ran into some problems. I don’t know if this is a difference between ingredients available in the US or not, but self-rising flour and store-bought almond milk both usually have salt in them. I just wanted to let others to know in case they thought of doing the recipe. Making your own almond milk and self-rising flour isn’t difficult if you do want to proceed. This is a UK recipe. There are so many low iodine recipes with US ingredients and measurements that don’t exist in the UK, I thought it was about time there was an English recipe. In the UK none of these items contain salt. And yes it is best if you can make you own almond milk – store bought tastes vile. I am very interested with your layout of your recipe box, will you share with me what software you used? I did it manually and it looks ugly and not consistent. Thanks so much for your time and look forward to hear from you again.